While I'm not usually a fan of Ravi, here is one of his I'm prepared to give a few spins. 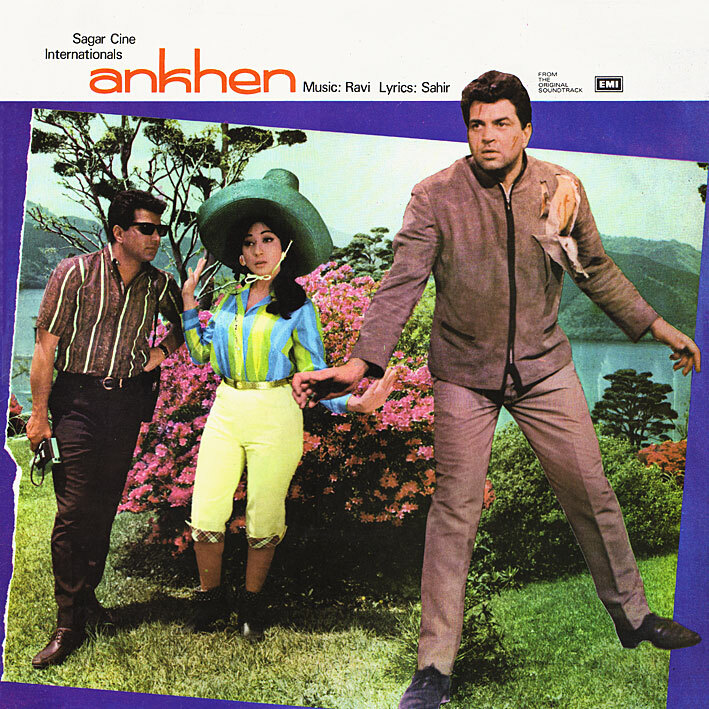 'Ankhen' is a spy film I think... the score isn't exactly overflowing with the sound and feel of international espionage (whatever that is), but it does include two great Lata Mangeshkar songs; the sweet and tuneful 'Milti Hai Zindagi Men' and the atmospheric 'Gairon Pe Karam'. I keep coming back to both. 'Loot Ja' and 'Tujhko Rakhe Ram' are OK too; lively and upbeat, but ultimately a bit lackluster in terms of arrangements. Not enough glamour perhaps, not enough danger. Not enough distinction. Thanx again.. you are belting chartbusters week after week. Coming back to Ankhen.. this one is still remembered for it's music and deadly screen presence of the lead actor - Dharmendra! Waiting for the pics of forthcoming releases on flickr! You have some RD beauties lined up, can't wait !!! Btw, do you have the vinyl of "The Train" (1970) by RD ?. Re. The Train, no I don't. Unfortunately. ...did you want me to send you The Train ? MP3s I have already, thanks. Nice :) Consider yourself linked.